Use the following links to download targets in PDF format. If you do not have software capable of viewing or printing PDF files, you can download Adobe Reader for free here. If your round is hitting high-center, your wrist may be breaking upward as you fire. To remedy this, be sure to keep your wrist firm as you fire the handgun. 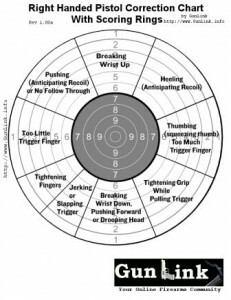 If your round is hitting center-right, you may be using too much trigger finger or you could be “thumbing” the pistol. Many agree that a good trigger finger placement is to have the trigger at your distal joint (the joint between the pads of your fingertip and mid-finger). Also be sure not to try to squeeze the pistol grip too firmly with the thumb of your trigger hand. 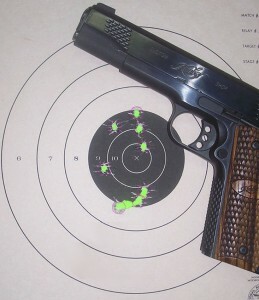 If your round is hitting high-right, you may be heeling in anticipation of the handgun’s recoil. See note above. If your round is hitting low-left (around 8 o’clock), you may be tightening your fingers too much as you fire the pistol. Hold your hand straight out in front of you and fold your fingers back and press the pads of your fingertips onto the heel of your hand. Generally, your hand will try to move slightly toward the inside of your wrist as your muscles tighten. You can see how this could be problematic. If your round is hitting low-left (around 7 o’clock), you may be jerking or slapping the trigger during your shot. Make sure that your trigger pull is smooth and deliberate. With a little practice on these targets you should have your rounds in the ten ring in no time. A friendly word advice that comes from experience: remember to keep a spare target at your shooting bench! It’s no fun squeezing off a round on the target only to realize that you can’t read the markings from your bench. When is that next cease fire, again? can you help me? I am new to shooting and would like to find a target that i can shoot at the range 25yrd , but with the target size at say maybe 50 yards i hope you can understand what im trying to say.. I just want to see how far i can shoot accurately in an indoor range. I’m pretty sure that I get what you’re saying. If I understand you, this is pretty much exactly how Project Appleseed runs their qualifying tests. On one sheet of paper they show you multiple “head and shoulders” targets that get progressively smaller. Placed at 25 yards, the targets simulate the same target at increasing distances. These targets go by the name of “Fred’s Quick N Dirty AQT Target” and are available directly from Fred HERE or from the Appleseed store HERE. On a side note, Project Appleseed is a great program, especially if you are interested in learning the fundamentals of marksmanship (plus get a bit of a history lesson on the American Revolution). For more information, to find events near you or to talk to an instructor, you can check out the Project Appleseed board on the GunLink Forums. Charley Myers also offers scaled down IPSEC/USPSA targets to simulate greater distances at closer ranges. So you would use a 2 inch target. This formula might not be perfect, but it’s close enough for what we’re tying to do. Especially given that this isn’t a perfect simulation of shooting at a distance with respect to bullet drop/hold-over, wind and other conditions. Custom designed. Contact us via the forums and we can put you in touch with the developers. When printed out on a 8×11 paper, or should it be made bigger, where is it placed, distance wise? 7m, 10m, 20m? it shouldn’t matter what size or distance you place the target. the wedges go out from the center and the lines would continue past the edges of the target to make bigger wedges. i print mine on regular paper and shoot at 10 yards give or take. Yes, the above should be correct. The “pie pieces” of the target tell you what a possible cause of shooting in a particular area of the target might be attributable to. You can shoot them at any distance and size you are comfortable with that allows you to get your shot on paper. Just aim dead-center and compare the POI vs POA. We have had several readers provide feedback that they even printed out a few extras just to keep in their range bag and not shoot. Then, if they are not hitting where they aim on another target, they just compare their hit to these charts. Pingback: Accuracy issues shooting Glock left handed? This is an old but well used training tool. Very good would recommend this to anyone who wants to improve. Thank you for the targets. Targets are great helped me at the range ! Awesome to hear, Robert. Thanks for leaving feedback. We’d love to see you on the forums over at http://www.GunLink.info/forums. I would like to add; these targets are also very good for dry fire practice/training. When you can’t go to the range for live fire, dry firing is your key to much better performance on the range. Every successful shooter uses dry firing in their training regimen. Now you may ask, “how can this target help me when my bullets are not hitting it?”. Well, looking at the basics of shooting a component that many shooters miss is the “Focus on the front sight as you break the shot”, it should be a clean and crisp front sight focus. In dry firing and properly focusing on the front sight as the trigger breaks, you will see the front sight slap in a direction of where the bullet would have landed on the target. If you see that front sight go up, down, left or right, then the pieces of the pie from these targets apply to what you just shot. Dry firing is very dry/boring training. Once you are training in your dry fire sessions, take exactly what you have done to the range with live ammo, but fire your weapon as though it is empty, performing the exact motions you did in your dry fire training. Overcoming the bang and recoil is hard for some but getting yourself in that mindset when you’re live firing is very very important. I’m wondering if these are usable for rifle flinch as well? If not, do you know if such a thing exist? I would guess not. The way you interface with the rifle versus the pistol is completely different, different points of contact in different places in relation to each other, etc. For instance, on a pistol, your trigger finger is usually the furthest thing forward. Pulling right on the trigger typically brings the muzzle right (around the axis of your strong-hand palm). Pulling right on a rifle trigger could tend to bring the muzzle left, around the axis of your forward-most point of contact: your weak hand. G&A published an article about how to read rifle targets, but it isn’t really a chart like these. You can also try asking in the Project Appleseed boards on the GunLink Forums. A big part of Appleseed is rifle marksmanship and they may have some pointers. My wife is taking up pistol shooting and I’m loving having a partner at the range. The interesting thing is that when she’s shooting she’s developing a friction sore (not quite a blister) on her trigger finger after about 100 rounds with a 9mm. That’s regardless of which pistol she’s shooting (Walther PPQ, Kimber 1911 etc.). She’s a left handed shooter and her shots are generally grouping loosely between 1 – 6 inches below center and between the 4:00 and 6:00 position. I suspect grip and trigger finger issues. Any thoughts or advice? That might be a better one to ask the peanut gallery on the forums at http://www.GunLink.info/forums to reach a wider, more interactive audience. I’ve only had that happen on one pistol – a KelTec P11 before the Northwood trigger job – and it was due to the lousy factory trigger shape and function. You are probably right about it being a trigger finger issue, with the finger having up/down or left/right movement during the trigger pull or follow-through instead of coming straight back. Let her rest up a bit so that she has a “fresh” finger, and then – with a SAFE, UNLOADED pistol with some snap-caps – try some dry fire practice with you watching her trigger finger closely. See if you can spot her finger moving around on the trigger. If you don’t see anything out of sorts, have her dry fire for a few hundred (boring, I know) shots around the house while paying attention to what she’s doing and practicing good fundamentals. If the blister doesn’t come back from that, investigate her grip; it could be that she does not have a good, positive grip on it and the muzzle flip from the recoil is causing the pistol to move relative to her finger instead of vice versa and causing the blister. Ensure a good, firm, two-handed, thumbs forward grip with as much hand surface area making contact with as much pistol surface area as she can. Thank you for the targets. Got one of these from a friend some time ago and it really helps. Very cool blog!!! Love the positive, to the point and very respectful advice and comments. I will definitely recommend it to my friends. The targets are designed with one handed shooting in mind. Gross errors like too much trigger finger pulling it toward your strong side, too little pushing it to weak side, or flinching to anticipate recoil should probably show up the same. However, with a proper solid two hand grip might diminish the effects of the error because you have an extra hand in the mix that is helping to hold the pistol steady and correct the mistakes your strong hand is doing.